Nothing Better than food that warms you up.And man with the week my husband and I had I need something easy and comforting vs the stress ball I have felt like since last week. Now I know Soup isn’t going to fix life’s problems but for just a minute it seems like it will. 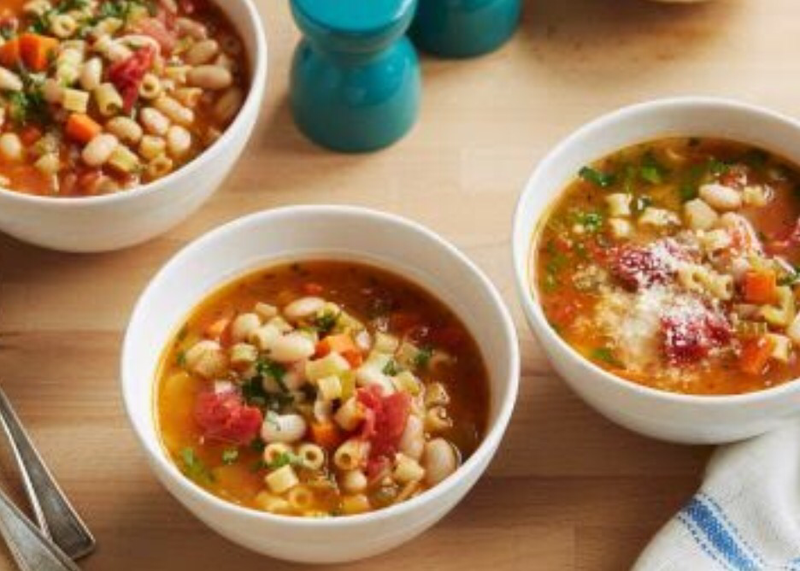 This is a quick-to-fix version made with canned beans and store-bought broth and because the pasta absorbs quite a bit of the added liquid, it turns out very thick more like a stew than a soup. All you need is a salad to round out the meal, but a slice or two of garlic bread and a glass of Chianti are great additions. Preparation: Using a conventional or hand held immersion blender, purée 3/4 cup of the drained beans together with 1 cup of the chicken broth and set aside. Heat the olive oil in a medium-sized stockpot over medium heat. Add the Pancetta cook 4 minutes then add onion and carrots and sauté, stirring frequently, until the carrots are crisp-tender, 5 to 6 minutes. Add the celery and garlic and continue cooking for 2 to 3 minutes longer. Add the crushed red pepper and oregano and season to taste with salt and pepper. Stir in the tomatoes, whole beans and remaining chicken broth and bring to a simmer. Add the pasta and cook, stirring occasionally, until the noodles are tender. Add the puréed beans, taste and adjust the seasoning if needed, then stir in the fresh parsley. Ladle into individual serving bowls and grate some cheese over the top of each. Recipe Notes: If you like a thinner soup, simply add a little more broth and adjust the seasoning accordingly.